Altrusa is an international service organization dedicated to improving communities worldwide. With almost 10,000 members, Altrusa has 361 clubs in ten countries. Members work on promoting literacy and identifying and solving community problems through original projects and by partnering with other organizations or agencies. Altrusa International of Rochester, Inc. was chartered as a club in 1950, thirty-two years after Mamie L. Bass founded the first club in Indianapolis. Mamie is famous for saying women should not just be good, they should be good for something! The most well-known Altrusan was Eleanor Roosevelt. Nine years ago we invited Bill and Joanne Cala of Joining Hearts and Hands to present an update on their work building schools in Kenya. We have partnered with them to both build an entire classroom and fund three scholarships for girls to attend high school. The idea to invite guests beyond the club membership spurred the search for a large enough facility and a means of serving a simple catered supper. Thus was our first April Shower born. The second year we were aware of the need of families who must raise children whose parents have been incarcerated or killed. The Catholic Family Charities group sponsored support for them, known as Kinship Care and were in desperate need of all those wonderful items that any baby shower bestows on an expectant mother. Members and guests filled the Christ Church community room once again, this time with blankets, diapers, outfits and so much more. Our third year we invited our guests to bring pampering toiletry items and such which we all assembled into shower caddy baskets to be presented to women arriving at Jennifer House, a post-prison outreach ministry of Spiritus Christi. Year four was focused on the libraries at both School 42 and the Rochester International Academy. At RIA immigrant children from grades Kindergarten to twelve arrive in hopes of learning English while simultaneously learning New York State Regents curriculum for their age level, whether they could read at that level or not. Many wonderful books were purchased and donated to both libraries. Year five we were thrilled to partner with Maggie Harris of the Community Lutheran Ministry on Joseph Avenue. Maggie ran an after-school programs and summer camps, helping keep up to 200 children off the streets and engaged in safe learning situations. We filled the room with aproximately 50 invited guests and members who brought many items on Maggie's Summer Camp Wish List. Our sixth shower beneficiary was The Women's Place, a program of the Catholic Family Center. The Women's Place is a 19 bedroom temporary shelter for single women and women with children awaiting permanent housing. The Women's Place goal is to provide homeless families and individuals with shelter while helping to move them into permanent housing. Our seventh shower beneficiary was Cameron Community Ministries After School Program. The after school program is for elementary school children who attend School #54. The primary emphasis is on homework completion, tutoring, positive behavior and conflict resolution. Year eight our shower beneficiary was the Open Door Mission's Residential Home for Women and Children. This program will provide transitional housing and support services for homeless students and their moms. It is designed to be flexible so that, based on the needs of the family, the families may stay there for 3 months to a year. Our April 2018 Shower beneficiary was the Crisis Nursery of Greater Rochester. The Crisis Nursery provides temporary care for babies and children during family crisis when the family has no other trusted support. The shower was held on April 26th from 5:30pm to 9:00pm, at Parish of the Holy Family Nellis Hall, 250 Coldwater Rd, Rochester. A portion of the proceeds from the Gift Basket raffle will be donated to Crisis Nursery of Greater Rochester. Our guests were asked to bring an item or two from the wish list for the "Crisis Nursery of Greater Rochester". In the Fall of 2016, Altrusa completed its thirteenth year participating in the Rochester Children's Book Festival. This wonderful festival brought many of our local children book authors to one location. There were craft and reading rooms, workshops by authors on the craft of writing every half hour and many community groups' tables to visit. The 20th Annual Rochester Children's Book Festival was on Saturday, November 12th, 2016, in the Flynn Campus Center at Monroe Community College. If you have not attended this wonderful event please plan to do so this coming Fall for the 21st Annual Rochester Children's Book Festival on November 4th, 2017. Please take a few minutes to visit our Altrusa of Rochester table and learn of our many community events. 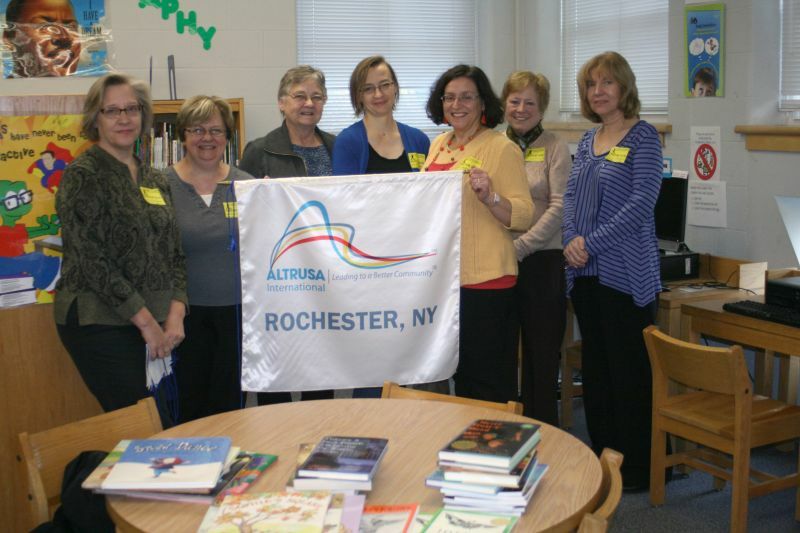 Thirty five of the invited authors from the Rochester Children's Book Festival also volunteered to partner with Altrusa at our city schools in the thirteenth annual "Festival to Go". This event was held on October 12th, 13th, and 14th at School 45 Mary McLeod Bethune. On October 19th the authors were at School 10 Dr. Walter Cooper Academy and on October 25th at School 33 John James Audubon. There were over 100 presentations in the classrooms, from kindergarten to grade 8, that brought the writing and reading experience to the students. The Altrusa Club purchased books from the presenting authors and donated them to each school library. Each author did a 45 minute presentation in the classrooms with their focus around these books. The Altrusa members joined the authors in the classrooms to share in this wonderful experience with the children. Certificates of appreciation were presented to each school librarian, as well as each author, by the Altrusa members. A special thank you to author, Vivian Vande Velde and Altrusa member, Jody LaRose for coordinating the "2016 Festival To Go". We also wish to thank the participating authors and the Altrusa members who volunteered their time at the schools. Support Altrusa Intl Foundation of Rochester NY Inc.